That’s it, you think as you pile your weary bones into the car and leave Johnston Ridge. The End. Fini. As you reverse your course through the blast zone, watching that remarkable She-Hulk of a volcano with its gaping wound recede in your rearview mirror, as the volcanic desert is once again hidden by thick stands of trees, you feel a species of sorrow. That was a remarkable day. There will never be another quite like it. Hold your nostalgia. It ain’t over yet. There’s an encore. An extremely delicious one. Patty’s Place at 19 Mile House. Image courtesy Patty’s Place. About one short year after Mount St. Helens’s paroxysmal eruption in 1980, two couples opened a restaurant. Jan and Roy Finkas and Milt and Susan Wheeler’s 19 Mile House remained a popular food stop on Spirit Lake Highway for over two decades. It closed in 2008, but not for long. Patty and Sam Gardener, with the urging and help of the Finkas, Wheelers, plus some former employees, reopened it as Patty’s Place at 19 Mile House on May 1st, 2010 – just in time for St. Helens’s 30th anniversary. And business has been booming [further gratuitous volcanic pun redacted] ever since. All right. Imagine yourself now, tired, dusty, thirsty and hungry after a super-long day of geoadventuring. And here, in the lazy last light of a Pacific Northwest summer evening, in the heart of a lush river valley, is this long country house with a big sign proclaiming rest and refreshment within. There’s a crumpled truck with a story in front, too, but it can be safely ignored in favor of foodstuffs for now. 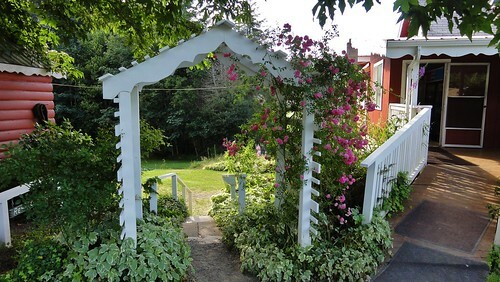 Just wend your way through the lovely arbors full of roses, perhaps pausing a moment to inhale deeply of their rich fragrance (barring allergies). Arbor of roses at Patty’s Place. Now, if you’ve timed matters just so, you’ll have arrived after the dinner rush, but comfortably before closing. However. Don’t expect the place to be empty. It won’t be, and you’re about to find out why. If you can, and if the weather is amenable, get a table on the back patio, overlooking the North Fork Toutle River. Geology isn’t over! You can do this bit sitting comfortably. Before diving into dinner, have a glance at the river. 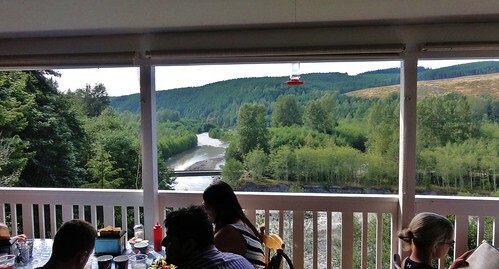 View of the North Fork Toutle River from the back patio at Patty’s Place. 1. Every damn thing on the menu is delicious, so don’t expect me to guide you here. 2. If you’re on a diet, fuggedaboutit. Unless your dietary restrictions are due to health or moral reasons, they are null for this evening. Besides, you just burned about nine trillion calories. So, unless you’re vegan, revel in the fact that everything here is real and fresh: real cream, real butter, real roast meat, real hand-crafted patties, real fresh veggies and fruit – much of it locally sourced. 3. Do you love comfort food? Prepare to be comforted. 4. But above all else, remember: you MUST save room for the cobbler. Or at least order some to go. Cobbler. Cobbler. Oh, my heck, the cobbler. Listen: you’ll know when I’ve just tucked in to my first spoonful. I order it to go, warm it a bit, and add just a scoop of panna gelato. You’ll hear a kind of hybrid scream-groan of sheer ecstasy. Just the rich, sweet-but-not-overly-so, succulent fruit paying compliments to that beautiful variation upon the theme of cobbler that is the sugar-crusted sweet biscuit square floating atop that berry bliss… as my teeth crunch softly on that sugar and sink into the fruit-and-gelato heaven below, I understand what gastronomic bliss is and why our species pays homage to cooks like Patty. All right. Now you can turn your attention to the river below. See the volcanic ash in its bars? The boulders in its banks? You can see it’s cut its way through layer upon layer of lahar, the most recent being from Mount St. Helens’s recent spasms. 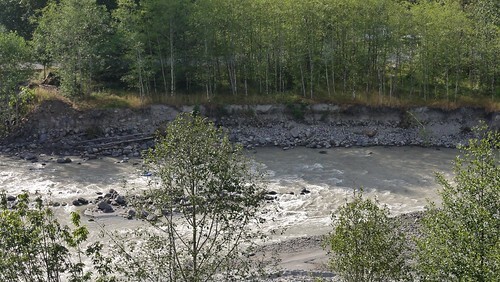 This river valley has been inundated by more than one mudflow. Speaking of which, now you can (possibly) move again, let’s go out front to have a close gander at one passenger upon such a flow. Don’t bother looking for boulders. We’re after a truck. Damaged Weyerhauser truck in front of Patty’s. Patty kindly answered my queries, and informed me it’s “an old fire truck from Weyerhauser’s Camp Baker that was washed down the river in the mudflow during the 1980 eruption.” Pause and consider that: this not-at-all-small piece of logging equipment found itself picked up by a churning river of mud, hot rock, and steaming water, and churned down the valley in a mass of boulders, logs, other equipment, and who knows what else, bashed against bridges, and finally landed here, miles away, when the flow lost its force. That’s hella amazing power. Feel free to inspect it, and report back on your findings as to the effects of the eruption upon this vehicle. Patty’s Place is seasonal, so be sure to time your visit between the first weekend in May and late fall, when the snows close the mountain again. Special thanks to Patty Gardener for her help with this post. For further information on the May 18th, 1980 eruption of Mount St. Helens, do feel free to peruse the Prelude to a Catastrophe series should you have missed it. Originally published at Rosetta Stones. Burns, Scott (2011): Field Guide to Mt. St. Helens north. Portland State University. Decker, Barbara and Robert (2002): Road Guide to Mount St. Helens (Updated Edition). Double Decker Press. Doukas, Michael P. (1990): Road Guide to Volcanic Deposits of Mount St. Helens and Vicinity, Washington. USGS Bulletin 1859. Pringle, Patrick T. (2002): Roadside Geology of Mount St. Helens National Volcanic Monument and Vicinity. Washington DNR Information Circular 88. I’m still stuck on the cobbler way back there at the restaurant. Uuunnnngh, cobbler, yum. We had one whole place in town with a decent cobbler (they served cherry only, crispy crust, not too sweet, and would sell out more days than not) and it closed like six years ago. I don’t suppose it would be ridiculous to fly three thousand miles just to eat dessert, would it?